Researchers at Oxford Brookes University have just published a paper looking into whether flavonoid-rich cocoa drinks might have an effect on MS related fatigue. Fatigue is extremely common in MS, affecting up to 90% of us with the condition. It has been described as many things, but my own personal favourite is that it is like having “jet lag, the flu and a hangover all at the same time.” It can be extremely debilitating and have a huge impact on home, work and social functioning, and a profoundly negative effect on quality of life. Fatigue can be extremely difficult to manage, and more effective strategies are urgently required. So what are flavonoids, and how might they help?! Well, they are commonly found in plants and have a variety of functions, ranging from producing the different colours on the petals of flowers, to antimicrobial properties that protect the plant’s roots from disease. In the human diet, they are abundant in fruits, vegetables, tea, wine and cocoa. Flavonoids are known to have antioxidant, anti-inflammatory and even anti-cancer effects, and have previously been shown to improve fatigue levels in those with chronic fatigue syndrome, following four weeks using dark chocolate (containing 70-85% cocoa). In this new study, the team performed a randomised, placebo-controlled trial, containing 40 people (10 males and 30 females), diagnosed with relapsing remitting MS for less than 10 years, and with significant fatigue levels (>4 out of 7 on the Fatigue Severity Scale). The participants were then randomised to have a high or low flavonoid cocoa drink daily for six weeks. The cocoa was added to heated rice milk and was to be taken at the same time every morning, following an overnight fast. They were asked to then wait 30 minutes before consuming any food, beverage or medications. Fatigue and fatigability were measured at 3 points; the beginning of the study, at week three and at the end of the study. Participants rated their fatigue level from 1 to 10 (10 being the worst fatigue they had experienced). Fatigability was tested using the six minute walk test. This measures the maximum distance an individual is able to walk in six minutes, on a hard, flat surface (in this case a 16-metre university corridor). Their results showed that fatigue levels improved in 57.9% of those people in the high flavonoid group, compared to 40% of people in the low flavonoid group. They also found that participants given high-flavonoid cocoa walked further during the test, increasing from 360.9 metres to 394.6 metres at six weeks. This was compared to 344 metres to 354.5 metres at six weeks in the low flavonoid group. They acknowledge that larger studies are needed to confirm their findings, and specifically suggest designing a trial large enough to test for the potential benefits of flavonoids in cognitive fatigue, anxiety, depression and pain. Until then, why not enjoy a nice warm mug of high-flavonoid (70-85%) cocoa with your favourite alternative milk. In terms of risks versus benefits, I think this particular intervention compares rather favourably! Note: People on the OMS diet should not consume dark chocolate, even if it has a high percentage of cocoa solids. This is due to the cocoa butter content which is high in saturated fat. 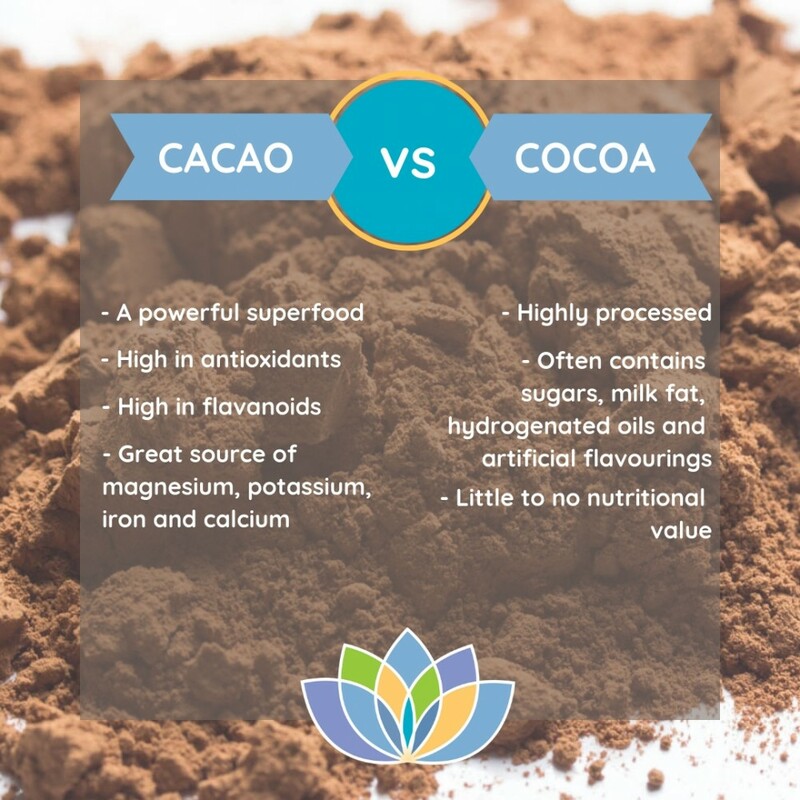 Here is a helpful graphic to show the difference between what is often referred to as 'cocoa' and 'cacao'. Cacao is often used for the untreated ingredient, and cocoa is often processed at a high heat.